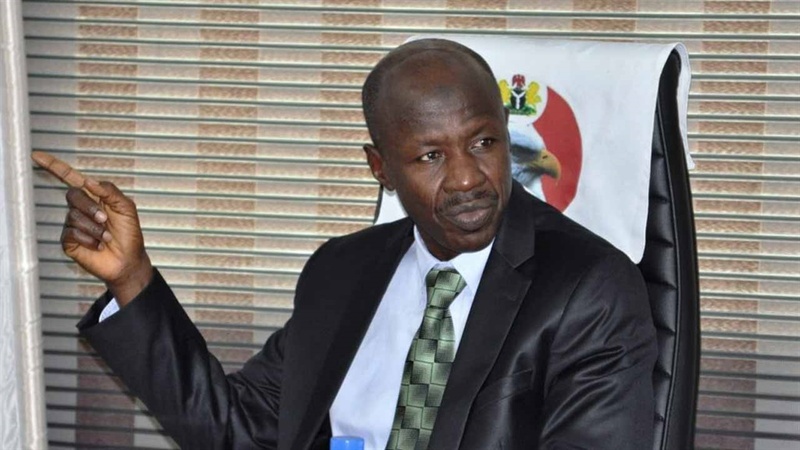 The Economic and Financial Crimes Commission (EFCC) has clarified remarks credited to its Acting Chairman, Ibrahim Magu, concerning the Ikoyi whistleblower on Thursday. Spokesman of the commission, Wilson Uwujaren, said in a statement on Friday that Magu never said the whistleblower has been paid his compensation as being insinuated in a section of the media. The informant had provided intelligence that led to the recovery of $43.5 million, £27,800 and N23.2 million stashed in an apartment on Osborne Towers in Ikoyi, Lagos on April 7. By the Federal Government’s whistleblower policy that took effect in December 2016 informants are entitled to between two and five per cent of the looted sum recovered. Uwujaren had quoted the EFCC acting chairman as saying in Vienna, Austria, that the Ikoyi whistleblower is now a millionaire by “virtue of the percentage he is officially entitled to’’. “We don’t want anything bad to happen to him after taking delivery of his entitlement. He is a national pride”, he reportedly told a United Nations anti-corruption conference. However, one Yakubu Galadima claiming to be a lawyer to the whistleblower reportedly countered the EFCC boss, saying his client had not been paid. Galadima also reportedly said that the recovered amount “was N17 billion and not the N13 billion being declared’’. However, Uwujaren said; “What Magu said at the 7th Session of the Council of State Parties to the United Nations Convention Against Corruption in Vienna, Austria, was that citizens should be encouraged to embrace whistle blowing because of the incentives attached. “To illustrate this, he stated that the gentleman who provided the information that triggered the huge recovery at Osborne Towers in Ikoyi was already a millionaire based on the incentive in the whistle blower policy where information providers are entitled to between 2.5 and 5 per cent of the recovered sum. READ: Did EFCC Lie About Paying Ikoyi Money Whistle-Blower? The EFCC spokesman said the exact amount recovered in the Osborne Towers operation was never a subject of controversy as the counting of the money was streamed live. He said the counting was also witnessed by the whistle blower, security at the Towers and representative of the agency which claimed ownership of the money.